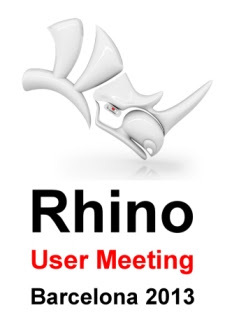 We are glad to announce the Rhino User Meeting Barcelona 2013 on the 11th February at the IED Barcelona. The final agenda will be available soon: it will include the latest news on Rhino 5, Flamingo nXt, food4Rhino, VisualARQ, Lands for Rhino, Clayoo, RhinoGold 4.0, VSR Shape Modeling y VSR Realtime Renderer. We can also confirm presentations by Andrés de Mesa (Rhino and Grasshopper in La Sagrada Familia), Jorge Biosca (Transportation Design), ControlMAD (Diego Cuevas), Luis Fraguada, FAB LAB Barcelona (Tomás Díez), CODA (Pep Tornabell, Enrique Soriano), Modelical (Roberto Molinos), SMD arquitectes (Oriol Carrasco, Alba Armengol), MedioDesign (Juan Pablo Quintero), Manuel Hidalgo. All presentations will be in Spanish or Catalan.